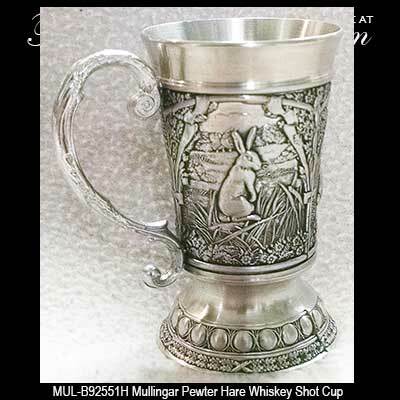 Irish shot glass features pewter construction that includes an embellished handle along with rabbits on the embossed panels. This Irish shot glass features woodland designs on its three panels that are embossed with rabbits. The pewter shot glass measures 2 1/2" tall and will hold 1 1/2 ounce of whiskey. 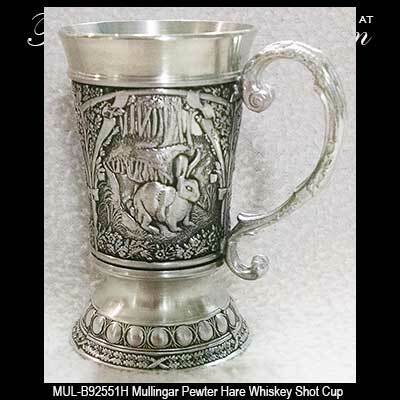 The hare shot glass is made in Ireland by Mullingar Pewter and it is gift boxed, complements of The Irish Gift House. Irish shot glass features pewter construction that includes an embellished handle along with ducks on the embossed panels. Irish shot glass features pewter construction that includes an embellished handle along with foxes on the embossed panels. 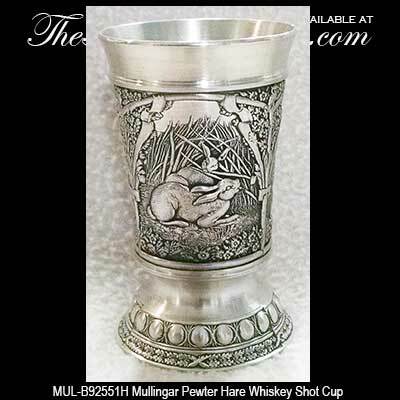 Irish shot glass features pewter construction that includes an embellished handle along with deer on the embossed panels.